The Global Volcanism Program has no activity reports for Koro. The Global Volcanism Program has no Weekly Reports available for Koro. The Global Volcanism Program has no Bulletin Reports available for Koro. The Global Volcanism Program has no synonyms or subfeatures listed for Koro. The 16 x 9 km, shark-tooth-shaped Koro Island, located between Fiji's Viti Levu and Vanua Levu Islands, is part of the volcanic Lomaiviti Islands. A chain of basaltic cinder cones of upper Pleistocene or possibly Holocene age extends from north to south along the crest of the island (Coulson, 1976). With the exception of one location on the west coast where young lava flows reached the sea, the youngest lava flows, erupted from the NNE-SSW-trending cinder cone chain, are confined to the central plateau, where they form a flat, undissected lava field that extends primarily to the east. Coulson F I E, 1976. Geology of the Lomaiviti and Moala Island Groups. Fiji Min Res Div Bull, 2: 1-162. The Global Volcanism Program is not aware of any Holocene eruptions from Koro. If this volcano has had large eruptions (VEI >= 4) prior to 10,000 years ago, information might be found on the Koro page in the LaMEVE (Large Magnitude Explosive Volcanic Eruptions) database, a part of the Volcano Global Risk Identification and Analysis Project (VOGRIPA). There is no Deformation History data available for Koro. There is no Emissions History data available for Koro. The 16 x 9 km, shark-tooth-shaped Koro Island is located between Fiji's two major island groups. 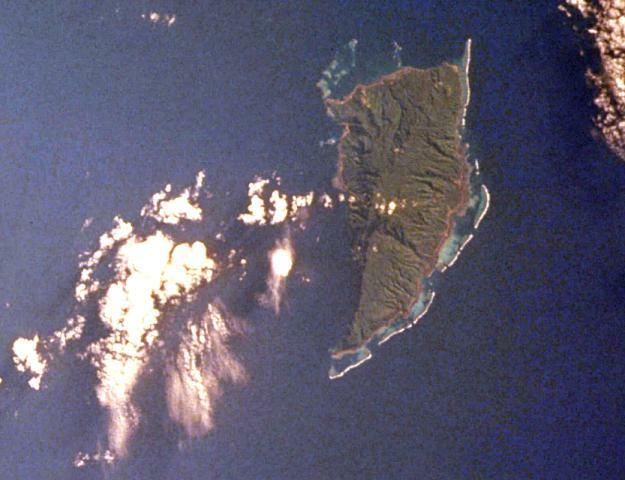 A chain of cinder cones of upper Pleistocene or possibly Holocene age extends along the crest of the island from the NE tip (upper right) to the sharp-pointed southern tip. The youngest lava flows are mostly confined to the central plateau, the flat area around the small weather cloud north of the prominent SE-trending drainage. The flat, undissected lava field extends primarily to the east. There are no samples for Koro in the Smithsonian's NMNH Department of Mineral Sciences Rock and Ore collection. Large Eruptions of Koro Information about large Quaternary eruptions (VEI >= 4) is cataloged in the Large Magnitude Explosive Volcanic Eruptions (LaMEVE) database of the Volcano Global Risk Identification and Analysis Project (VOGRIPA).